This report presents data on the cryptocurrency and ICO market changes during 2017-2018, with special emphasis on an analysis of the changes that have taken place since the beginning of January 2018, including over the last week (January 22-28, 2018). ** After December 1, 2017, the ZAK-4 index was calculated using the cryptocurrencies Bitcoin, Ethereum, Bitcoin Cash, and Ripple. *** When calculating the ZAK-8 index, the cryptocurrencies with the largest capitalization are used. At present (January 28, 2018), the cryptocurrencies Bitcoin, Ethereum, Bitcoin Cash, Ripple, Litecoin, Cardano, Stellar and NEO are used. According to the data of coinmarketcap.com (at 00:00 UTC), during the analyzed period (January 22-28, 2018) there was a fall in market capitalization by 10.9%, to $562 billion. For the third week in a row capitalization has shown a downward trend, with the Smith + Crown Index, in turn, dropping from 34,190 to 27,019. The dominance of the four and eight largest cryptocurrencies as of January 28, 2018, (00:00 UTC) equaled 67% and 75.2%, respectively (see Table 1.1). Last week total cryptocurrency market capitalization ranged from $490 billion to $630 billion, which led to a depreciation in the prices of 15 of the top 20 cryptocurrencies in terms of capitalization. The prices of some cryptocurrencies may fluctuate from -50% to +50% over the course of a single day. Therefore, when performing an analysis of cryptocurrency price trends, it is advisable to use their average daily amounts on various cryptoexchanges. Below we consider the top 10 cryptocurrencies that showed the largest drop or gain in price over the past week (fig. 1, 2). In this regard, only those coins and tokens with a market capitalization of over $1 billion and a 24-hour trading volume of more than $10 million (according to the data of coinmarketcap.com) were considered. Tables 1.2 and 1.3 show the possible factors or events that could have had an influence on the fluctuation in prices for certain cryptocurrencies. Table 1.4 shows the possible factors or events that could have had an influence on the cryptocurrency market in general. Since the volatility of each digital asset or cryptocurrency is connected with overall trends on the cryptocurrency market, the fall in the prices of individual cryptocurrencies over the past week by 0-10% is completely understandable. 1 Ardor ARDR 20.06% 1.00 1 There was no bad news related to Ardor, in fact on January 23 an announcement on the update of the platform and the elimination of bugs was published. The factors leading to the fall of Ardor were most likely tied in with the cryptocurrency market development cycle, which showed a downward trend last week. After reaching a peak price of $2.50 on January 16, Ardor began to fall, together with the entire market, amid the news from South Korea and the expiration of the first bitcoin futures. 2 Verge XVG 16.29% 0.09 1.4 Despite the fork performed on January 24, Verge lost more than 16% over the week, which might be attributable to the volatility typical for this cryptocurrency over the past few months and the overall trends on the cryptocurrency market. 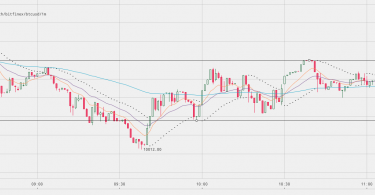 3 TRON TRX 13.74% 0.07 4.6 Tron began trading on Bitfinex and announced its impending listing on another cryptoexchange, but this did not help it to escape the negative trend that began after the sharp fall in its price on January 5. 4 Ripple XRP 13.6% 1.28 49.5 Despite the favorable news on its new partnership with Mercury FX and IDT, which plan to use xRapid for transfers, the Ripple price continues to fall steadily from its record high of $3.50 on January 4. This negative trend can be tied to the downward trend of Ripple and the cryptocurrency market as a whole. Also, experts explain the growth in Ripple that started at the end of 2017 with the heightened demand formed by major players. 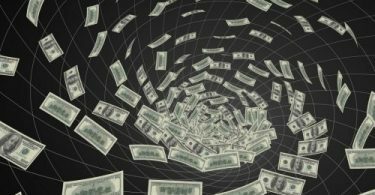 The Ripple price was affected to a certain degree this week by the issue of a rating of cryptocurrencies by the respected rating agency Weiss Ratings, which assigned the currency a somewhat disappointing “C” rating. Meanwhile, Ethereum, Ripple’s main competitor, was assigned the “B” rating. None of the cryptocurrencies received the highest “A” rating. 5 ICON ICX 13.48% 8.21 3.1 Icon has shown high volatility throughout the last month and, since it was not the subject of bad news over the past week, it is safe to conclude that the fall in its token price was due to market trends. 6 IOTA MIOTA 12.55% 2.51 7 The MIOTA community and developers kept their news to themselves last week, and it is possible that the price of the cryptocurrency changed in line with the negative trends on the market which started in late December 2017, when it hit its record high of nearly $5.70. 7 Qtum QTUM 12.35% 41.27 3 This cryptocurrency, together with other currencies, was assigned a relatively low “C” rating by Weiss Ratings. Therefore, the fall in the price corresponds to overall trends on the cryptocurrency market. 8 Bitcoin Gold BTG 11.85% 190.31 3.2 Bitcoin Gold received a fairly low rating in the recently published cryptocurrency ratings of Weiss Ratings. The assignment of a “D+” rating means that this cryptocurrency is not very attractive. 9 Omise GO OMG 11.63% 16.40 1.7 The change in the prices of OmiseGo and Zcash last week can be regarded as volatility corresponding to overall cryptocurrency market trends. A general conclusion can be made about the sensitivity of some cryptocurrencies and digital assets to overall market changes: the greater their growth during a period of cryptocurrency market growth, the larger their fall during a downward adjustment. Even during the downswing of the cryptocurrency market, some cryptocurrencies and digital assets with a capitalization of more than $1 billion showed fairly good growth last week (fig. 2). 1 Walton WTC 49.92% 41.15 1 Walton began appreciating in early January with a string of favorable news items on its listing on a new exchange, the commencement of its work with a Chinese association of mobile IoT and the upgrade of the improved version of its wallet. The growth in the token last week was most likely due to the news on the upcoming announcement of a new partnership. 2 Populous PPT 47.19% 67.76 2.5 Populous did not make any announcements on its Twitter account other than an invitation to try out a simulation of the beta version of its platform. Total trading ranged from $2-6 million, which is quite low compared to the token’s capitalization. 3 BitShares BTS 26.64% 0.51 1.3 It is possible that the main reason for the growth in the Bitshares cryptocurrency was the positive rating it received from Weiss Ratings (a “C+” rating). This shows that the project is promising and worthy of attention. This hypothesis is supported by the fact that the price began to grow on January 24, on the day when the rating was published. 4 Stellar XLM 25.95% 0.63 11.3 Stellar issued a new roadmap last week, and announced that it is preparing to launch the OpenGarden cryptocurrency on its main network, which together could account for its growth. 5 Steem STEEM 18.66% 6.20 1.5 The main event of the week for Steem was the receipt of a favorable rating from Weiss Ratings, which placed this cryptocurrency in the top five of the 74 analyzed cryptocurrencies. Its rapid growth began on the date of publication of the rating, January 24. 6 0x ZRX 8.48% 2.02 1 The 15% appreciation in the 0x token may be indirectly linked to the news published on the project’s Twitter channel on January 26. 7 EOS EOS 5.22% 14.72 9.3 EOS was assigned a high “B” rating by the Weiss Ratings agency. 8 Ethereum ETH 5% 1161.99 113 Ethereum was one of the few cryptocurrencies that was given a high “B” rating by Weiss Ratings agency. Ethereum’s founder announced that the platform is getting ready for the launch of Sharding technology, which is intended for scaling of the network. 9 RaiBlocks XRB 4.51% 20.22 2.7 The issue of a new Whitepaper on January 24 helped RaiBlocks to overcome its negative trend and even show slight growth over the week. 10 NEO NEO 1.19% 143.71 9.3 The growth of the NEO price was triggered by the positive rating from Weiss Ratings. Based on the results of last week, only 12 of the cryptocurrencies with a capitalization of more than $1 billion showed a positive price trend. To analyze trading activity on cryptocurrency exchanges, the ZAK-n Crypto index is calculated (see the Glossary). The values of the ZAK-4 Crypto and ZAK-8 Crypto indices are presented in Tables 1.1, 1.5.a, and 1.5.b. For example, on January 4, 2018, the 24-hour trading volume (Volume 24h) for the four dominant cryptocurrencies (Bitcoin, Ethereum, Bitcoin Cash, and Ripple) exceeded $40 billion (Table 1.5.a). The value of the ZAK-4 Crypto equaled 8.1%, which attests to the extremely high liquidity and market dynamism of the dominant cryptocurrencies. By the start of the downturn on the cryptocurrency market (January 17, 2018) the value of the index had reached 9.7%, i.e. the daily turnover of cryptocurrencies equaled nearly 10% of total market capitalization. The 24-hour trading volumes (Volume 24h) for the eight dominant cryptocurrencies (Bitcoin, Ethereum, Bitcoin Cash, Ripple, Litecoin, Stellar, NEO, and Cardano) equaled $16.8 billion at the end of last week (Table 1.5.b), i.e. 4% of their market capitalization. The ZAK-4 Crypto and ZAK-8 Crypto indices are considered in more detail in Tables 1.5.a and 1.5.b. 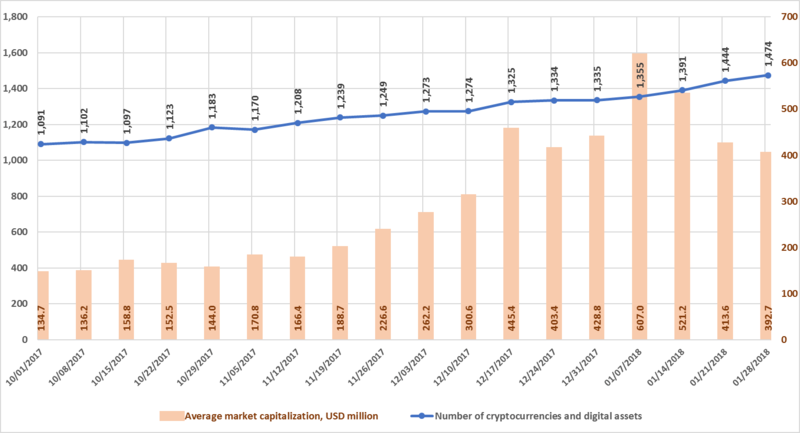 The weekly cryptocurrency and digital asset market trends from October 1, 2017, to January 28, 2018, are presented as graphs (Fig. 1.1-1.5)*. Number of cryptocurrencies and digital assets Fig.1.3 This figure shows the trends in the increase of the number of cryptocurrencies and digital assets circulating on cryptocurrency exchanges. On January 1, 2017, their number was 617, and as of January 28, 2018, this number had already reached 1,474. Figure 1.1 shows a graph of the weekly cryptocurrency market change from October 1, 2017, to January 28, 2018. Over this period, market capitalization increased from $146.9 billion to $578.8 billion, a growth of 3,170% relative to the start of 2017. Over the first week of January 2018, total market capitalization exceeded $800 billion for the first time, but over the following three weeks (January 8-28, 2018) total market capitalization decreased from $822.5 billion to $578.8 billion (as of January 28, 2018, based on the average figures from coinmarketcap.com). Despite the significant growth in cryptocurrency market capitalization in Q3 2017 and over the entire year, the market is susceptible to sudden and drastic fluctuations. The highest growth rate in Q4 2017 was around $200 billion, or 54%, during the week of December 17-24, 2017. During the first week of January, market capitalization increased by approximately $250 billion, or 44%, but over the following three weeks decreases of approximately $100 billion, $130 billion, and $20 billion, respectively, were seen (with due account of average daily data, see fig. 1.2). The total number of cryptocurrencies and digital assets listed on exchanges has grown since the start of October from 1,091 to 1,474. Their number increased by 30 over the past week alone, from 1,444 to 1,474. In this regard, over the past three weeks average cryptocurrency and digital asset capitalization has decreased from $607 million to $392.7 million. The market has fallen for three weeks in a row. However, last week the rate of reduction slowed and the severity of the reaction to the events in South Korea softened, giving hope that the “bear” market trend may be replaced with a more optimistic outlook. This is supported by the data provided by the Cboe and CME exchanges and published by CFTC (the Commodity Futures Trading Commission) in its weekly report on futures trading. It follows from these data that on January 23, 2018, the number of “long” contracts on the Cboe, which reflects its clients’ expectation of a growth in prices, was approximately double that of “short” contracts, which reflect their expectation of a drop in prices. If you compare these data with the data for the previous five weeks, when the situation was the opposite, i.e. the Cboe had more “short” contracts, it is safe to say that most of the traders on this exchange expect a growth in the Bitcoin price. Average token performance (ATP) Average performance of funds spent on buying tokens or average ratio between the current token price and token sale price over the period (month, quarter, year), i.e. the average reward per $1 spent on buying tokens during the token sale, if they are traded on exchanges for USD. 1 Data source: tokendata.io, icodrops.com, icodata.io, coinschedule.com. Only popular and/or successfully completed ICOs (i.e. ICOs which managed to collect the minimum set amount of funds) and/or ICOs listed on exchanges were considered. For some ICOs information may currently be incomplete (for instance, the amount of funds collected). 2 Average token reward on ICO projects during 2017 and 2018. For example, token reward or the ratio between the current token price and the token sale price, i.e. the average reward per USD 1 spent on tokens during the token sale, if they are subsequently listed for USD on a cryptocurrency exchange, equals $47.86 for projects completed in 2017. To calculate this ratio, the authors used the data from 382 ICOs completed in 2017. The maximum token reward for projects completed in 2017 was 6,398.61x for the Spectrecoin ICO (based on the assessment made on January 4, 2018). 4 The data for many ICOs are incomplete or non-existent. The data for January 15-21, 2018, were adjusted to account for the appearance of more complete information on past ICOs. Last week (January 22-28, 2018) the amount of funds collected via ICOs equaled $269.2 million. 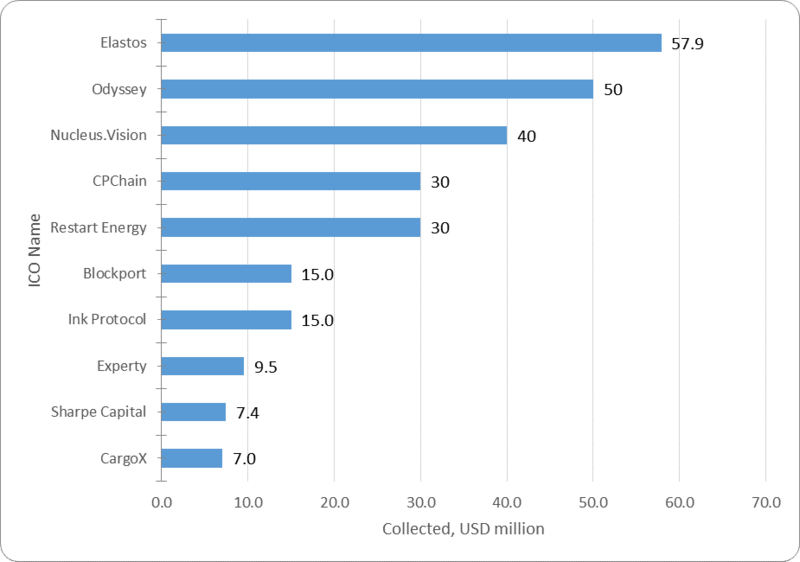 This amount includes the results of the 15 most successful completed ICOs, with the largest amount collected equaling around $57.9 million (Elastos ICO). 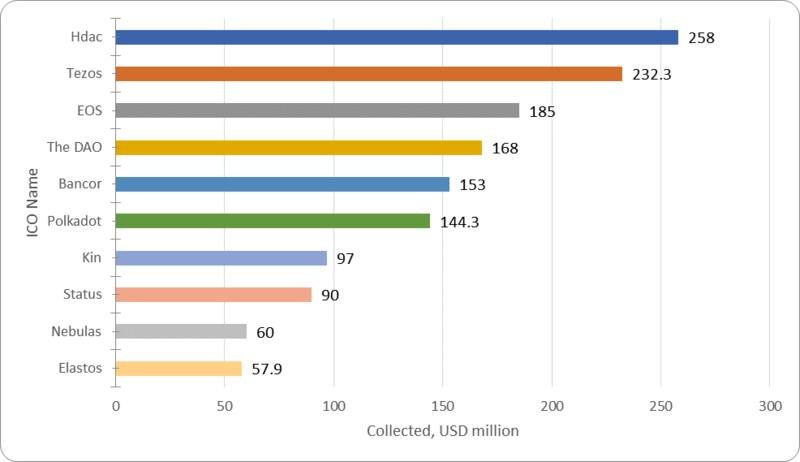 The average amount of funds collected per project was $17.9 million. More detailed information on the 15 main ICOs completed over the past week is given in Table 2.5. 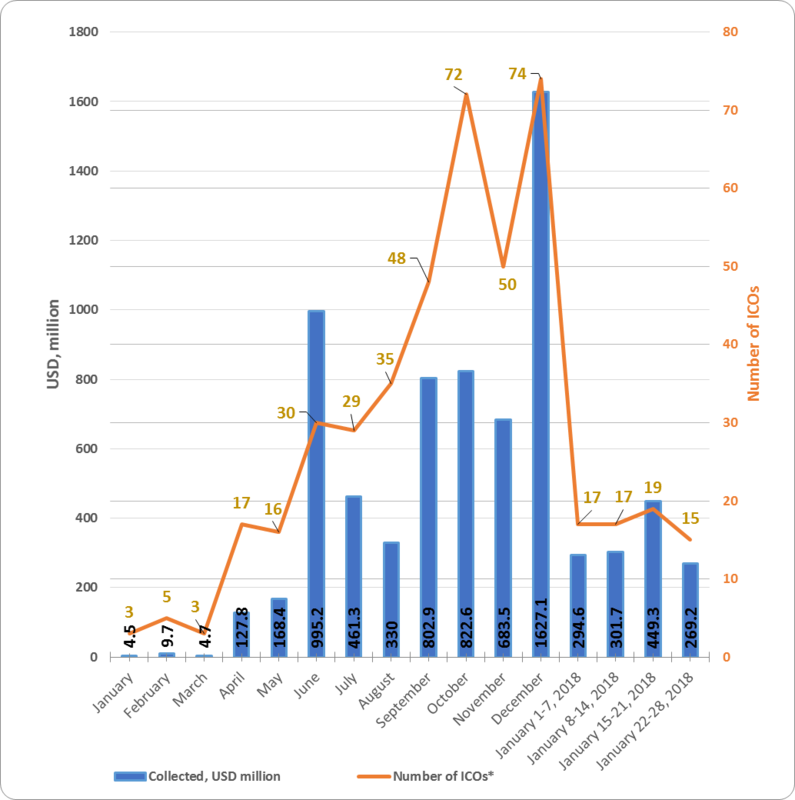 The number of projects conducting active ICOs as of January 28, 2018, is 243. There is presently information available on at least 154 planned ICOs to be conducted after January 28, 2018, including at least 31 ICOs which will start next week. 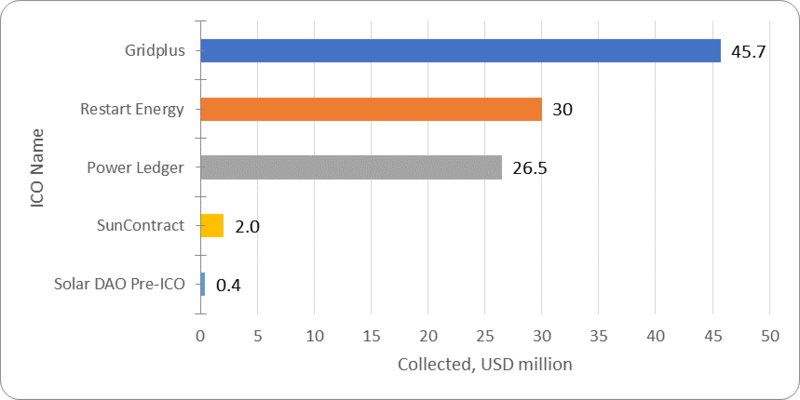 Table 2.4 shows that the greatest amount of funds was collected via ICOs in December 2017. The average funds collected per ICO in that month equaled $22 million. The data for last week (January 22-28, 2018) may be adjusted as information on the amounts of funds collected by completed ICOs is finalized. ** When compiling the lists of top ICOs, information from the websites tokendata.io, icodrops.com, icodata.io, coinschedule.com and other specialized sources is used. The ICO project categories correspond to the information from the website coinschedule.com. If there is no information on the website concerning the project category at the time of compilation of this analytical report, the category is determined by experts. Table 2.5 shows the top 10 ICOs which were successfully completed over the past week (January 22-28, 2018). The leader for the week was the Chinese project Elastos, which aims to create a new type of decentralized internet. Figure 2.2 presents the ten largest ICOs completed last week. The list of top ICOs by category is compiled with due account of the categories of the leading ICOs for the week. * When compiling the lists of top ICOs, information from the websites tokendata.io, icodrops.com, icodata.io, coinschedule.com and other specialized sources is used. The ICO project categories correspond to the information from the website coinschedule.com. If there is no information on the website concerning the project category at the time of compilation of this analytical report, the category is determined by experts. ** The top projects in this category completed in January 2018 are highlighted in red. At present, all projects from the top 10 in the Commerce & Advertising category have a token performance indicator of 1.47x to 16.59x. 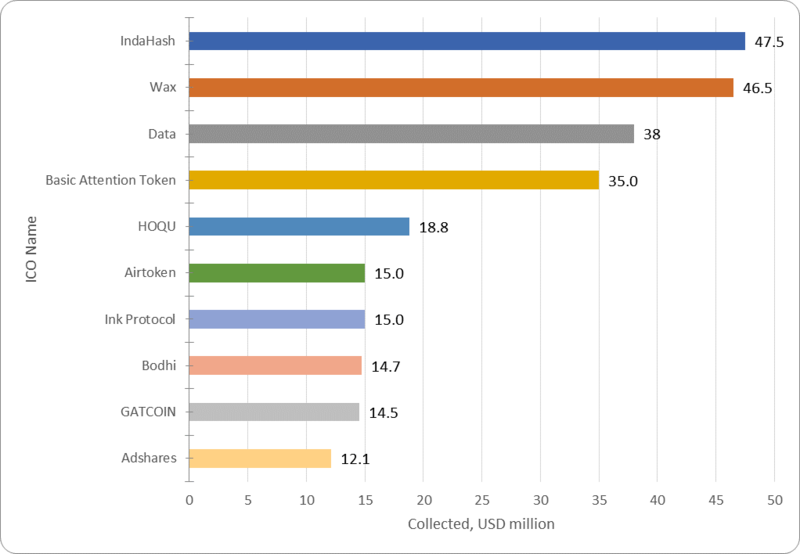 Half of the projects from the top 10 completed their ICOs in January 2018. The Basic Attention Token exchange listing can be considered one of the most successful ICOs, as this project has a current token price to token sale price ratio of 16.59x. When considering this indicator, it is important to remember that the Basic Attention Token ICO was completed on May 31, 2017, i.e. the 16.59x growth took place over more than seven months. The market capitalization of Basic Attention Token currently exceeds $600 million. The ratings of ICOs in the Infrastructure and Energy & Utilities categories are given below. Table 2.7 shows the top 10 ICOs in the Infrastructure category. Nearly all of these projects were performed in 2017. The leader for 2017 in this category was the Hdac project. The best token performance indicator, i.e. the best current token price to token sale price ratio, is 14.29x, and belongs to the EOS ICO. Its market capitalization currently exceeds $9 billion. Table 2.8 shows the top 5 ICOs in the Energy & Utilities category, one of which was completed last week. Over the past period (January 22-28, 2018), 15 ICO projects were successfully completed, each of which collected more than $100,000, with a total amount of funds collected of around $269.2 million. The leader of the past week of January 2018 was the Elastos project ($57.9 million). The total amount of funds collected by a number of ICOs failed to reach even the $100,000 mark (the information for some projects is still being finalized). The post Cryptocurrency and ICO Market Analysis [January 22-28, 2018] appeared first on CoinSpeaker.